If you have been waiting with baited breath for a white Apple iPhone 4 then I am sorry to inform you that you are going to have to wait several more months before it is available. Claudine Beaumont, Technology Editor of Telegraph.co.uk has confirmed that the white iPhone 4 will not be available until early 2011. So those of you who have requested a white iPhone 4 on their Xmas list are going to be very disappointed. Apple has not clarified the reason for this delay but many are speculating that the manufacturing problem is caused by colour matching the home button with the back and front plates on the handset. However, it would appear that fans of iPhone are still furiously buying the black iPhone 4 and last week Apple announced that they have sold more than 14 million iPhones in their latest financial quarter (that is approximately $8.6 billion in revenue). For those of you who would still like the classic black iPhone 4 there are some very good deals exclusive to the web. Vodafone, T-Mobile and Orange are worth checking out as they are offering monthly tariffs of £35-£45 -these offers are not made in your local stores. All monthly tariffs for iPhone 4 come with free voicemail and WiFi. The Carphone Warehouse are also giving good trade in deals for your old phone – useful if you are PAYG or on a short contract. For more information view our Buy Online webpage. You can now get the iPhone 4 for significantly less money on the Three network. As of this morning Three are stocking the iPhone 4 in a refurbished condition. “Three is pleased to announce that it has got its hands on the ‘Refreshed’ stock of the wildly popular 16GB iPhone 4. This model will be live on 3Store from around 10am this morning and is available on each of the four iPhone tariffs from Three. More information – Guide to finding a reconditioned iPhone. The RHS has recently designed a free app called “Grow your own” offering helpful information regarding growing fruit and vegetables. The base application is free and it covers the 20 most popular varieties of fruit and veg. Within the application itself you can buy an add-on for £1.79 to extend the content to an extra 16 plants and increase the functionality of the app. In the first month of its launch more than 100,000 people had downloaded the app to their iPhone. This ranks the app in the Top 25 Free Applications List compiled by Apple. Help to select veg and fruit based on your level of expertise, available space and time. Access to expert RHS advice: what to do and when. Common problems and what to do about them. Links to the RHS site for buying good quality plants. Access to RHS forum to chat with other gardeners. Calendar alerts to remind you what to do and when. Location-aware watering reminders and drought alerts. More add-ons are planned in the future. This app would make an ideal inexpensive gift for birthdays or Xmas for family and friends with iPhones. The content is suited to the less experienced, or less confident, gardeners but is also a valuable resource for all gardeners as they are out and about in their garden with their iPhone. This app is only free for a limited time. For more information go to www.rhs.org.uk/iphone or go to the Apple Store link on our site [click on buy online webpage on the top of Home Page]. There are dozens of bumpers , cases and wallets available online. We are all aware that the iPhone glass panels need to be treated with care and respect as dropping and damaging your iPhone is not a hardware failure. Square Trade have investigated and recorded the number of iPhone 3GS broken glass claims comparing this number to the iPhone 4 claims and found no real difference in the 2 models when you take into account that you have double the risk with an iPhone 4 as it has 2 glass panels. Square Trade’s suggest “fewer than 0.5 per cent of iPhone 4 owners have reported a non-accidental claim” which strongly denies some media claims that iPhone 4 glass is less reliable than iPhone 3GS. However, the iPhone 4, having a glass back as well as a glass front, means it does have a lower coefficient of friction than the iPhone 3GS. This means it takes less force for your iPhone 4 to slip around and fall to the ground. The two-glass design makes an accident more likely – so protecting with a case and careful handling make good sense. With Apples free bumper offer now ended you might be interested in our choice of the best iPhone cases. 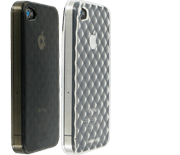 The first 3 cases are designed for iPhone 3G & 3GS models from Proporta accessories and the last 3 cases are for iPhone 4 and can be purchased online – visit the o2 website. As pictured below (prices around £25), the Shine is a flip-open case made out of glossy patent leather, and available in black, red or blue. Inside the case there’s a mirror so that you can check your visage before that important business meeting or hot date. You can select a number of different print linings for the inside of the case, including zebra skin or floral patterns. We think this case is just as desirable as the device it’s housing. 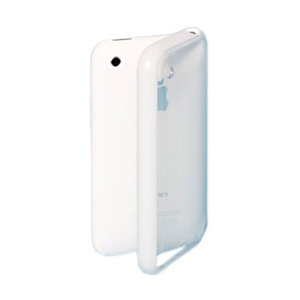 The new Shine Case for your Apple iPhone 3G from Proporta has a sleek high gloss patent leather exterior, fits like a glove and looks as stylish; while the magnetic closure system keeps your iPhone 3G protected and out of harm’s way. And for a subtle twist, the mirror is framed with a funky, soft feel zebra print lining. Exclusively available from Proporta Accessories. The Proporta Aluminium Lined Leather Case (Apple iPhone 3G/3GS) is handmade to meet the exact specifications of your device. Available in a variety of colours. 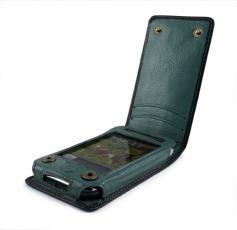 The Aluminium Lined Leather Case (Apple iPhone 3G/3GS) is hand crafted from high quality leather to meet the exact specifications of your Apple iPhone 3G/3GS. Featuring a trademark ‘Screen Saver System’, a sheet of rigid, lightweight aircraft grade Aluminium lines the Case to protect your precious device from crushing and impact shocks. Stylish and clever. Instructions on how to fit the case : open case and slide device in the opening at top of case. Styled by Ted Baker London – distributed by Proporta. 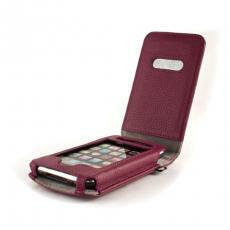 This stylish Leather Case is the ideal accessory for your Apple (iPhone 3G). Destined to get a great reception. Available in a range of colour options. The next 3 cases are designed for your Iphone 4 and can all be found at O2 Accessories – visit the o2 website. This is my personal favourite case & Available from O2 at £30 – visit the o2 website. 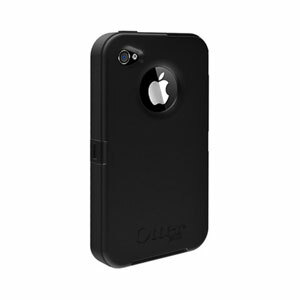 You won’t find a tougher case than the OtterBox Defender Series for iPhone 4. This three-layer case will keep your iPhone safe from drops, scratches, bumps and dust. Last, but not least, is the Griffin white case. 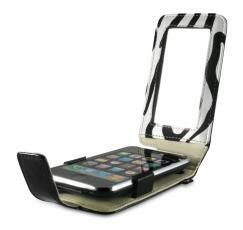 The Griffin Reveal Case for iPhone 4G is designed to shield your iPhone from the indignities of the outside world. If you cannot get a white iPhone 4 the next best thing is a white iPhone 4 case. For more information please visit the o2 website. Mobile phone operators frequently advertise unlimited data usage as part of their contracts with a clause regarding ‘fair usage’. What do they mean by fair usage? Contract deals that advertise unlimited data usage appear to give the mobile phone consumers a great deal -don’t they? Well, yes – unless you have a smartphone like the iPhone. Smartphones are so smart that they can multi-task and are great for downloading emails, songs, videos, TV shows and website pages using large amounts of MB’s. For example, streaming video to your mobile could burn through 500MB of data per hour. In the past, before smartphones, consumers were unlikely to use anywhere near the download limits but the fair usage contract clause is now limiting free downloading as avid mobile users have found to their cost. Orange charges users £3 per MB for exceeding ‘fair usage’ they typically restrict unlimited downloads to between 250MB and 750MB on monthly contracts. Vodafone, 3 and O2 limit customers to 500MB-1GB; Vodafone charges £5 per 500MB over the limit costs and 3 costs 10p per MB. Virgin and T-Mobile offer 1GB as standard although if you have a smartphone you are given a generous 3GB a month limit by T-Mobile. All the major mobile networks have a fair use policy. Be aware that these policies give the network concerned the right to terminate your contract or tariff if they believe you are utilising too many network resources. As described above each network sets explicit limits on data usage and these can varybetween tariffs on the same network. The limits are often hidden in the small print – although your tariff may advertise ‘unlimited’ data usage – they are not actually delivering this. For more information please check out our network links on the site. In 2008 Ofcom found that only 3% of mobile phone customers were locked into contracts for 2 years plus – in 2010 this figure has grown to 66%. The retail watchdog Consumer Focus suggest that when customers are tied into long contracts they shop around less for better deals and the mobile networks feel less pressure to compete on prices. Shorter contracts offer the chance for you, the consumer, to shop sooner for a more attractive deal and a new handset. Some companies like Orange offer their most competitive deals on 3-year contract and Orange is also the only one of the big six not to offer a 12 month contract. From May 2011 under the universal service directive across the EU all mobile phone network providers will be required to offer a 12-month contract and all contracts will be capped at 24-months. So if you are currently considering leaving PAYG and entering into a contract – be smart and make it short. Tesco Mobile are one of the few networks who are selling 12-month deals with a free phone included (Samsung C3050) for £15 a month. Tesco Mobile also has a 12-month contract at £20 a month for the Apple iPhone with the 8GB 3GS model costing £259. This deal includes 100 minutes of calls, unlimited texts and 3 months unlimited data. Check out this deal by selecting the Tesco Mobile link on the righthand side of this website. Tesco Mobile also has attractive Sim-only deals 100 minutes of calls and unlimited texts at £6 a month. So, if you do not want to upgrade your phone, save money by opting for a sim-only deal on a PAYG, or monthly contract. O2 offers a competitive deal with unlimited texts and calls at 8p a minute for only £5 a month – this deal comes under Giffgaff, part of O2 – check out our O2 link for more about this. The consumer watchdog has taken Apple to task over warranty issues as reports surface of new design problems relating to the iPhone 4’s glass body. Third-party iPhone 4 cases are reportedly causing the glass back panel to crack. The consumer watchdog’s concerns come as new reports describe large cracks appearing in the iPhone 4’s glass body when certain third-party slide-on cases are used. The affected cases are Apple-approved third party products, not the rubber “bumper” sleeves that Apple was forced to give away free following the antenna issue that caused reception problems when the iPhone 4 was gripped in a certain way by the hand. Apple has apparently found that non-bumper style cases – specifically those that slide on to the iPhone 4, which are occasionally prone to particulate matter getting caught between the rear of the phone and the case – can cause unexpected scratching that could quickly develop into much larger fracturing of the entire rear pane of glass. Apple is so concerned it has withdrawn all third party cases initially approved and sold in their stores. Some users had complained about Apple’s iPhone warranty process, specifically that they were receiving refurbished replacement models instead of new phones and that they had to wait weeks to get a replacement. The Wall Street Journal has suggested that Apple was working on a new version of the iPhone 4 for Verizon Wireless in the US to be launched early next year, that would have a slightly different form factor to fix some of the apparent design problems. Such concerns may indicate why a long-awaited white version of the iPhone 4 has still not been given a release date. 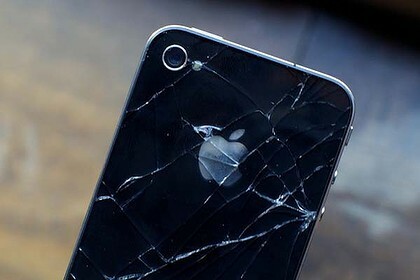 The glass design of the iPhone 4 has been described as ‘form over function‘ as within days of the handset’s launch, repair shops were complaining that the glass design was very fragile. Treat your iPhone 4 with respect as accidental damage is not covered by Apple under warranty. It might be worth considering Energizer’s new silicon case for your Apple Iphone 4 as it not only protects but also double’s up as a power source. The AP 1201 is designed to provide high-speed battery charge directly to the iPhone, or pass-through charge using a USB cable. It is good for approximately 500 charges. The AP 1201 is a direct response to the power deficits that users are experiencing with their iPhone 4. Apple sold 1.7 million iPhone 4 within days of its release. The iPhone 4 is a great looking mobile phone with an original shape, aluminum trim, sharp edges and two panels of glass. This new design has been described as ‘form over function’ – the iPhone 4 certainly looks superb but two panels of glass doubles the risk of inadvertly damaging the handset. The problems started soon after its release when it became clear that users found that the iPhone 4’s external antenna was blocked by the hand when covering the lower-left side of the handset- causing service problems in areas with poor coverage. Apple quickly resolved this problem by offering free bumper cases – a survey by Piper Jaffray analyst Gene Munster estimated that Apple lost 880,000 sales as a result of the antenna concerns. The bumper cases are not the cause of recent reports regarding cases that cause scratching and shattering of the phone’s rear glass panel. Non-bumper iPhone 4 cases are said to risk trapping particulate matter between the rear of the iPhone 4 and its case. Such dust particles can build up and cause scratches that may develop into larger fractures and cracks to the glass back. Apple has reacted quickly by removing all third-party cases from its stores and are currently investigating the problem. If there really is a widespread problem users will understandably start demanding compensation, or free fixes. However, future complaints should be minimised now that we have been alerted to the dangers and risks. If like me you would still buy an iPhone 4 then it might be the right time for you to get a good deal. Check our website links for current deals on reconditioned and new iPhones. Re your choice of case – forewarned is forearmed. Running unofficial apps and tweaks on your iPhone is known as jailbreaking. Customising your phone entails ‘hacking’ or modifying your iPhone’s operating system and allows the phone to run software that has not been approved by Apple. The first iPhone 4 jailbreak was posted online in August this year. The jailbreak code is a tweaked version of Apple’s own software and reliable evidence suggests that one in ten iPhones are now jailbroken. But before you embark on the necessary modifications – typically altering less than 50 bytes of an 8Mb operating programme- consider the costs and benefits of this step. If you jailbreak, or modify, your iPhone you are able to do things on it that are not available through official Apple channels. For example, you could make video calls on your iPhone network instead of over wifi. You would be able to add new features to your browser, or add facilities developed by Apple’s arch rivals, such as Google’s internet telephone service. Jailbreakers enjoy the sense of freedom to be able to shop outside the iTunes store for apps sold by alternative app stores. Cydia is an extremely popular choice with jailbreakers and their app VoipOver3G fools your jailbroken phone into thinking it is connected over wifi rather than 3G – thus allowing you to make internet phone calls over mobile broadband – forbidden by many networks. A defining characteristic of third-party apps is that they anticipate improvements needed by Apple users. For example, even 12 months ago unofficial apps enabled functions such as downloadable themes and wallpapers, multi-tasking and the ability to save apps into folders – these are all features that have been incorporated into the new iOS 4 operating system for the iPhone 4. Apple is fully aware of the increasing number of jailbroken iPhones and recently lost a legal battle to prevent consumers modifying their phones – the US Copyright Office stated that such small modifications to the operating system constitutes ‘fair use’ of Apple’s software. Apple says there are good reasons it does not approve of downloading software that hasn’t been through a strict vetting procedure as it carries a great risk (and 30% loss of revenue to App Store). Your jailbroken iPhone could be corrupted and fail to work properly, or be infected by third-party malicious apps – Apple will not repair jailbroken phones under warrenty. If you decide the risks are worth the benefits – the iPhone 4 jailbreak is fairly easily carried out through the iPhone. By directing your browser to jailbreakme.com and following the instructions. However, make sure you have an escape route if things start to get out of hand- back up your phone in iTunes before you make any moves to jailbreak. Then, if it all goes wrong, you can restore your original system and Apple should never know. The latest and popular iPhone jailbreaking tool RedSnOw 0.9.6b1 will jailbreak iOS 4.1 on iPhone 3G (but not on 3GS or 4). Beware, if you unlock your phone to enable you to use a Sim from a mobile network other than the one who sold you the phone, your tinkering could result in permanent damage. Unlocking can permanently alter the handset’s hardware and is detectable both by Apple and the network providers – rendering it unusable. In the UK (unlike the US) it is not really sensible, or necessary, to unlock your phone illegally as all UK networks will legitimately unlock an iPhone for you (except Vodafone). It might be safer to upgrade your handset to an iPhone 4 and enjoy all the benefits without the risks. Why not check out the current deals on our website? Although average broadband speeds have not improved dramatically in the last 12 months when you select your network you want the best options available for your iPhone. Broadband Genie, a comparison website, confirm that the highest average speeds come from Vodafone and T-Mobile – they are averaging 1.2Mb. Whereas O2 and 3 Mobile averaged 1Mb and Orange lagged behind at an average speed of 0.86Mb. Vittorio Colao, Chief Executive Officer at Vodafone, said there needed to be a greater focus on tiered pricing if internet service providers were to continue to provide low-cost web access. What makes the iPhone such a good test of the quality of a mobile phone network is that it is designed to download apps and browse the web – both are very demanding on a network. As the demands on 3G networks continue to increase Ofcom, the media regulator, confirmed that satisfaction rates are lower among dongle users than consumers with a fixed web connection. While the popularity of dongles continues to increase, many customers still have concerns over download speeds, data usage and reliability. A number of research initiatives have found that over 80% of dongle users have experienced service problems caused by low download speeds, coverage problems, and connection difficulties. Consumers want networks to tackle fundamental issues in broadband such as cost, quality of experience and value for money. Consequently, Vodafone, O2, T-Mobile and 3 are all requesting a higher power limit to support their supply of voice and data services in the UK. This move is in response to an agreement by Ofcom that the present cap of 62dBm per carrier can be extended to 65dBm and will thus allow for 3G mobile spectrum licences to be increased. Owning an iPhone has become something of a holy grail and currently the major networks are competing with one another to offer you, the consumer, the best deals on iPhone tariffs and prices. Vodafone iPhone website offer competitive packages well worth checking out. The attraction of iPhone is its impressive versatility so when choosing a tariff prioritise which features are best for you. Some deals on iPhone will offer you greater calling time and texts, others will focus on downloads and emails, plus the ubiquitous media centre needs consideration. For example, if you make more calls than you send texts you need to make sure you choose a package that is not biased towards texts. If you regularly like to download music and videos you will need a package that includes generous downloading time. Vodafone is currently offering online vouchers on iPhone 4 – code ‘PAYGMB’ why not start by checking them out?